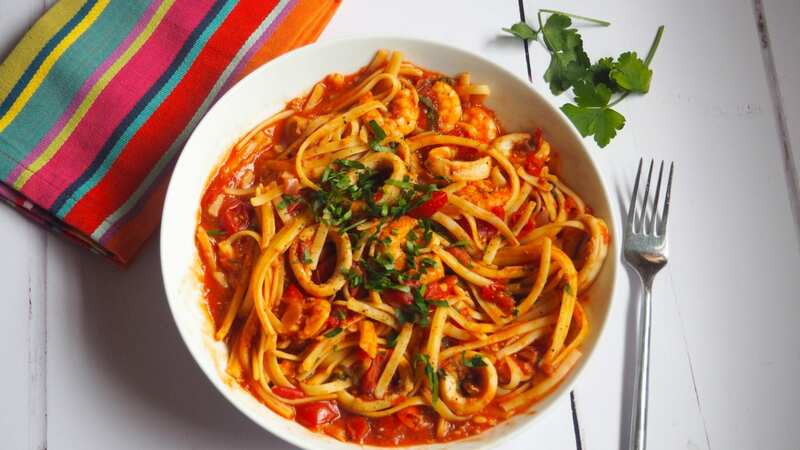 This Spicy Seafood Pasta is packed full of flavour with juicy prawns and calamari in a rich tomato sauce with a kick of chilli and chopped basil. Gluten and dairy free too. I love seafood especially prawns. Whenever we go out for a meal it is one of the first things that I look for on the menu closely followed by a steak. It has to be freshly cooked prawns though. None of this already cooked and reheated until it tastes of fishy rubber that some places serve up! 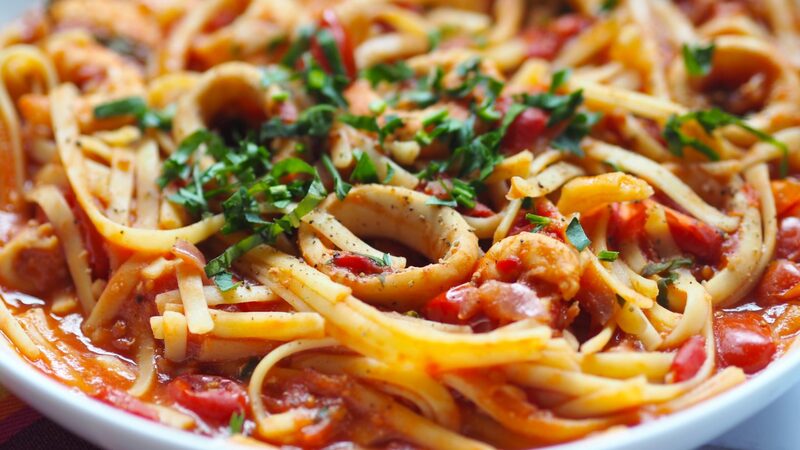 This Spicy Seafood Pasta dish is quick and easy to make plus it tastes ah-maze-ing. The chilli gives off the right amount of heat and you get the lovely sweet and peppery taste from the fresh basil. 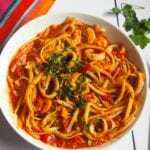 If you are following the Slimming World diet then this is Syn Free providing you don’t use fresh pasta or olive oil. 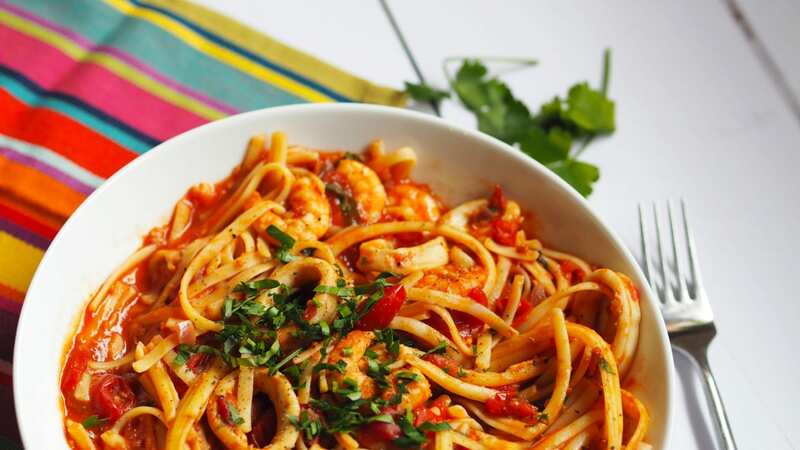 This Spicy Seafood Pasta is packed full of flavour with juicy prawns and calamari in a rich tomato sauce with a kick of chilli and chopped basil. It’s also gluten and dairy free too. Spray your frying pan with spray oil. Fry your chopped onion and chilli flakes over a medium-high heat until onions soften, then add your garlic ensuring it doesn't burn. Chuck in the squid and prawns, fry until they are cooked. Add the tinned tomatoes and season with salt and pepper, allow to simmer for 5 mins. Tear some basil leaves and put them into the tomato sauce just before the end of cooking. While this is cooking, boil your pasta as directed on the packet. 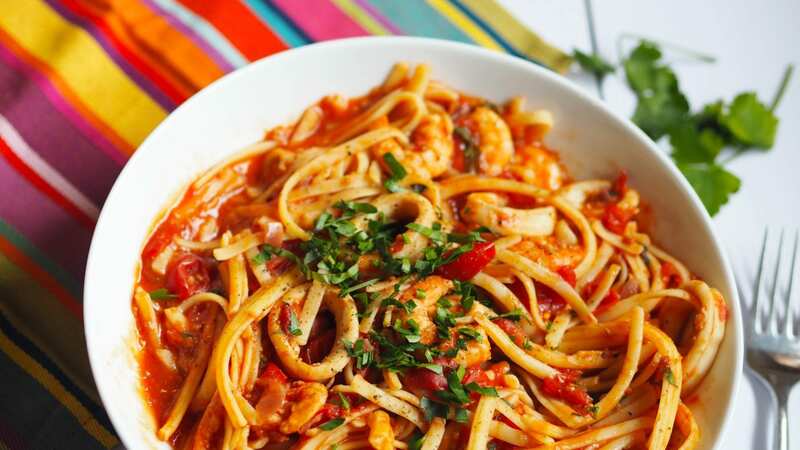 Once cooked all dente, drain and season if required then place into a bowl and add your seafood sauce to the pasta. Serve with a mixed salad. Plus if you fancy it a bottle glass or two of wine. You don’t just have to use prawns and squid, you could also add scallops, mussels or other seafood that takes your fancy. 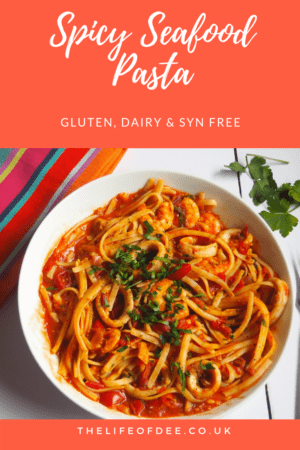 I used gluten free pasta but feel free to use normal pasta for this dish.